A ruler which does the measuring for you. Just click inside any picture or rectangular region, and have a ruler automatically placed for you. Like magic — instant measurements! Flip easily between different colors or opacity, to focus on the ruler or the image beneath. Adjust the ruler dimensions thereafter if required. 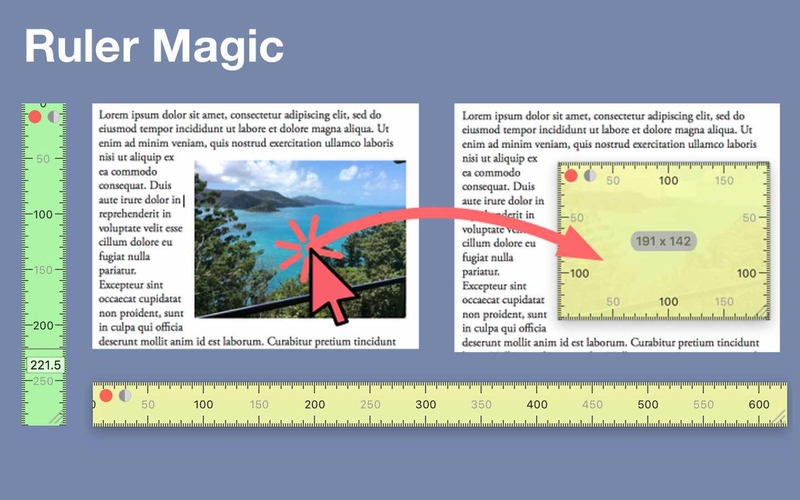 Ruler Magic's instant measuring works from within any program. Just hold the modifier keys (eg. control-shift) and click within a rectangular region, perhaps a logo in your design or an image on the web. It's much faster than measuring on-screen with a classic ruler, and much much faster than than looking up image or CSS dimensions. Ruler Magic will be available on the App Store shortly. Note: Ruler Magic doesn't install any extensions to your system. In order for it to work from any program it should be left running in the background. Ruler Magic does not collect or transmit any information to any party.